Yesterday, I managed to get two of the above notes. The Begawan Series or the 1967 Brunei First Modern Series is still a favourite among collectors. 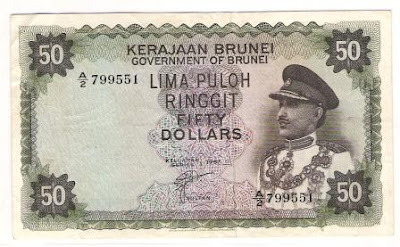 Issued in 1967, it marked the first time that Brunei issued its own currency by its own Currency Board. Prior to that, Brunei currency notes were issued by the Straits Settlements Government and the Malaya-Borneo Board of Currencies. The $50 Begawan Series are rarely available in the numismatic shops. In Kuala Lumpur, an uncirculated note is being sold for around MYR800 and in Singapore for around S$400 and on eBay for around US$300. A used note depending on the condition would be slightly cheaper but not that much cheaper if it is very fine or very good. I chanced upon these notes accidentally. One of our local food blogger recently emailed me telling me that she has recently came into possession of these notes. She asked whether she should deposit it into a bank. Anyway, I gave some pointers including the value of the notes and asked if she is selling some of the notes, can I also buy them. That was how I managed to acquire two of these notes to add to my collection. So I would suggest for those of you who has older aunties etc who you think might be hoarding notes, to ask them nicely. They might think they are just sitting on notes worth the face value but not realising the value of those notes have indeed risen beyond their expectation. One of my colleagues at the office was telling me this story when he asked one of his aunties. His auntie told him that she had plenty of paper notes but has deposited them in the local bank. She said that why don't they all go to the bank and take the notes out again. My friend laughed and told her that the bank will surely give back the amount of money she put in but she will never see the same paper notes that she had deposited in the bank. She certainly missed out on the increased valuation of those notes. Well, tell your auntie this story and tell me if you have any Brunei paper notes for sale.